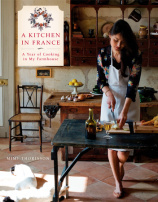 For an armchair traveler like me, Mimi Thorisson’s A Kitchen in France: A Year of Cooking in My Farmhouse transported me to another place. The book as a whole, Mimi’s recipes together with the photographs taken by the author’s husband Oddur Thorisson, offers a glimpse into their world of family, friends, dogs, food, home, and the French countryside in Médoc. Médoc is a wine-producing district in the Bordeaux region in Southwestern France on a peninsula between the Atlantic Ocean and the Gironde estuary, just north of the city of Bordeaux. Thorisson describes it as the “anti-Provence”, considered off the beaten track even from the French. For those not familiar with Mimi Thorisson, she writes the blog Manger, where she shares her version of French home cooking and her family’s life in rural France. No country bumpkin, she and her family chose to relocate to this region from Paris. In April 2013, Saveur magazine named this gem the Best Regional Food Blog. Mimi Thorisson’s approach to cooking is to savor what’s in season and to transform the best ingredients in simple ways. The book is organized by season, starting from the rebirth associated with Spring and working its way through Summer and Autumn before reaching Winter with its instinct for comfort and nesting. Each season opens with an essay sharing thoughts about food treasures she values at that time of year, whether grown in her garden, purchased at the market, or foraged near her home. Her story continues to unfold through the headnotes accompanying each recipe, sharing the provenance of the recipes from her kitchen. Thorisson has a deep connection to France. Though she grew up in Hong Kong, she spent summers in France with her grandmother and great-aunt where she learned to cook and appreciate seasonal local ingredients. The recipes in this book cover a broad range of French home cooking, from everyday fare such as simple roasted potatoes to special occasion dishes such as bouillabaise. Many of the main course recipes won’t be easily accessible to the typical American home cook because they call for unfamiliar meats that will require a trip to the butcher. For those with an intrepid palate and access to specialized ingredients like poussin, guinea hen, squab, quail, snails, beef cheeks, sweetbread, and oxtail, uncomplicated recipes to prepare them are on offer. That said, this book has something for everyone. There are plenty of other recipes for starters, side dishes, and desserts that are similarly uncomplicated and use seasonal ingredients that should be readily available to any home cook. At the end of the book, there is an unexpected group of recipes to celebrate Chinese New Year. These recipes are not out of place in this French cookbook because they reflect the author’s heritage (her father is Chinese) and just as she honors and celebrates the culinary heritage of her French mother’s family, she gives equal respect to her father’s Chinese roots as she passes down the traditions of the Chinese New Year celebration. This book can be equally at home in the kitchen or on the coffee table. As a cookbook, it is a compilation of recipes, but the gorgeous photos provide a temporary visit to the Thorisson home in the Médoc without leaving your couch. Disclosure: I received this book from Blogging for Books for this review. The opinions expressed are my own. Posted on 5 November 2014, in Books, Francophilia, Inspiration in Ink and tagged books, France, manger, mimi thorisson. Bookmark the permalink. 1 Comment. Betsy, I pre-ordered this cookbook but have only had a chance to glance at it. Thank you for this book review. I always ready Manger but have never made any of her recipes. I hope to try some of them soon. Keep me posted on what you make.